This Galeries tapestry shows a tapestry originally woven in Antwerp in 1640 by Jacob Wauters. It was a five part series of tapestries based on illustrations held by the English royal family. Here we see an intricate design that fills the senses with details of an elaborate garden scene with ornate columns, urns, and platform providing the support for gorgeous potted and climbing plants. Manicured trees in the background in the garden beyond are also seen. In the border itself, the gods in the four corners symbolize the four elements. The color tone is exquisite and classical with browns, greens and blue greens providing a cohesive color palette for this scene. 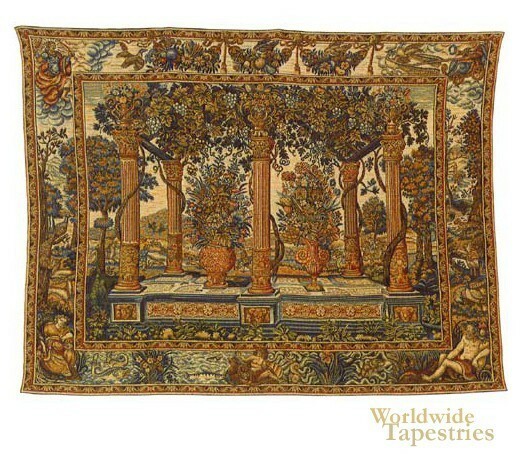 This fine art tapestry "Galeries" is backed with a lining and has a tunnel for easy hanging. Dimensions: W 38" x H 28"